Scribing works well in a variety of circumstances. Adult Writer's Groups: I use Scribing as one approach, among others, in creative writing workshops. Scribing encourages focus on dialogue and illustrates the "freshness" of style and vocabulary that can be found in a narrated story. It makes an enjoyable change for writers whose occupation is often solitary as well as offering an unobtrusive and effective support for writers with physical disadvantage. 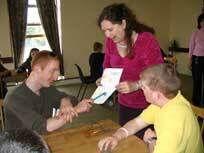 Adult Literacy: Scribing is highly effective as an adult literacy support and trained scribes can be of great help. Special Challenges: Scribing has been found of dramatic support to adults with specific learning difficulties as demonstrated in the "Penfriends" project.